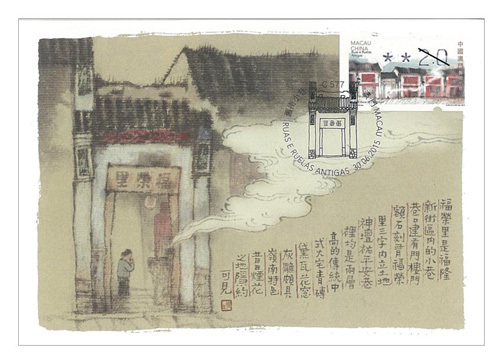 Macao Post will launch the third issue of definitive label stamp after the establishment of the Macao Special Administrative Region, on 30th June, 2015, with the stamp theme “Old Streets and Alleys”. The design is portraying the distinctive old street “Happiness Alley (Beco da Felicidade)”, tall eaves can be seen at the entrance to the alley, with the three Chinese words “Fok Veng Lei” engraved on a granite tablet. The alley is covered with long stone slabs, which is commonly seen in alleys throughout Guangdong. Happiness Alley (Beco da Felicidade) is commonly known as “Fire Street”. 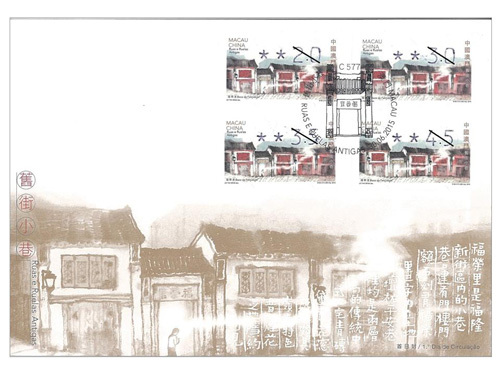 The area of Happiness Street (Rua da Felicidade) was a thriving commercial center in Macao, where Happiness Alley (Beco da Felicidade) is situated, used to be a hub for the prostitution, gambling and opium industries. Having been through the vicissitudes of history, it has witnessed Macao’s recent development. 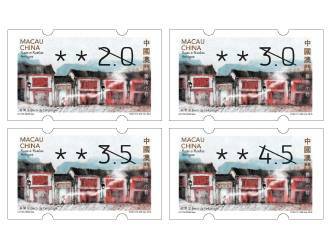 On the issue date, the maximum sales quota per queuing customer is 20 sets of label stamps, 3 first day covers with label stamps, 3 information brochures with label stamps and 3 maximum cards. 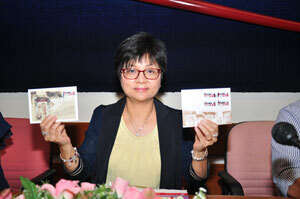 Besides, the automatic stamp vending machines located at the Macao Post Headquarters, the Maritime Ferry Terminal Post Office, the Red Market (Almirante Lacerda) Post Office, the Mong Ha Post Office, the Areia Preta Post Office, the 1st floor (beside the Museum shop) of the Macao Museum of Art, and the Communications Museum will have a temporary arrangement; the maximum time limit for using the vending machine is 10 minutes for each queuing customer. 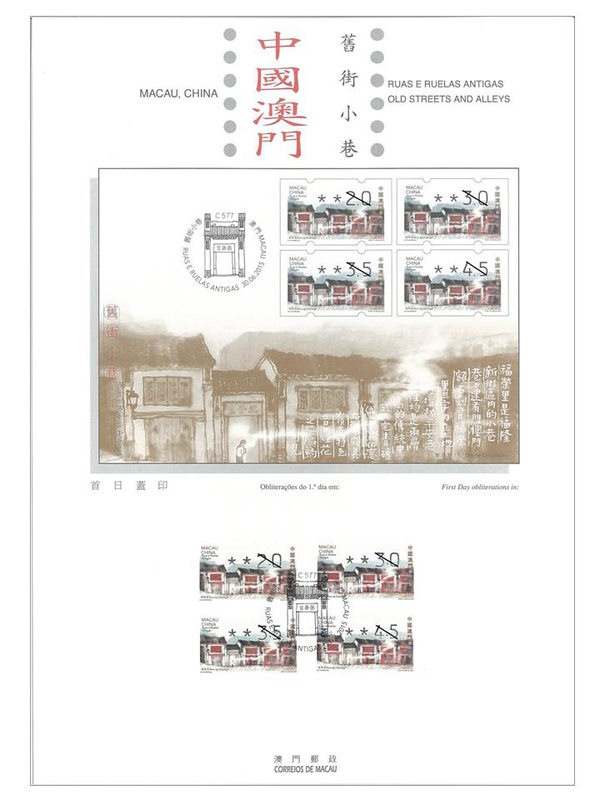 The stamp designer of this issue is Mr. Lei Tak Seng, and the text of the information brochure is written by the Civic and Municipal Affairs Bureau. This is the eighth issue in 2015. 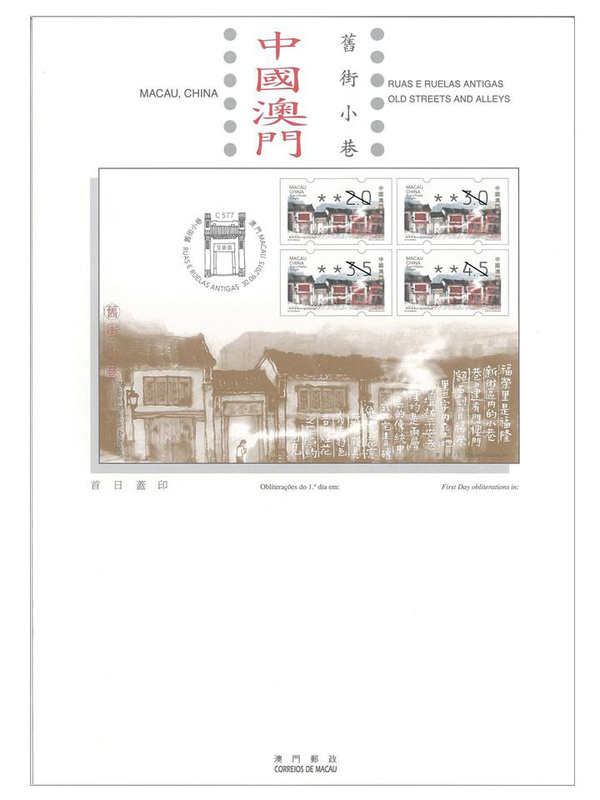 The previous issued stamps are “Lunar Year of the Goat” on 05/01/2015, the label stamp “Lunar Year of the Goat” on 28/01/2015, “110th Anniversary of Rotary International” on 16/02/2015, “Mainland Scenery VI” on 01/03/2015, “25 Years of AICEP” on 27/04/2015, “Macao Wetlands” on 05/05/2015 and “110th Anniversary of the Birth of Xian Xinghai” on 13/06/2015.